Milk has always been an elixir of life. It is one of the basic staples of our diet. It is important that we know more about one of nature's most valuable foods. In this article Milk, The Facts And Figures, you will find much that you need to know about milk. If you would like to know more, please post a comment on 'Back Chat' or email me at les@leslieback.co.za . I would be most happy to hear from you. Milk is one of the staples of a balanced diet. An unrivalled form of nutrition. Back Chat explores one of nature's most valuable foods. Despite milk’s crucial contribution to our diet, articles often appear calling into doubt its bountiful benefits. These doubts are generally based on anecdotal information, rather than sound scientific research. Dangerously once in print, these myths spread and they cause doubt and provide disinformation. Milk is a natural source of energy and a natural source of 15 essential nutrients. Besides these nutrients, milk also contains compounds that have been found to be anti-carcinogen; such as conjugated linoleic acid (CLA) and butyric acid. It is essential therefore to understand the makeup of this extraordinary, wholesome and safe source of goodness that provides us with so many health-giving factors. Dairying is the fourth largest agricultural sector in South Africa. The South African Dairy industry incorporates all the various and diverse functions that starts with milk production and end with our consumption of it. It is important to remember that the composition of milk varies according to the type and breed of animal, its state of health, and the diet on which it is reared. In most Western countries, the word ‘milk’ without specification, means cow’s milk, the most readily available kind. Milk is unique, nutritious and a major source of protein and calcium. Quite simply milk is a marvel of nature. Calcium is a mineral that helps build strong bones and teeth. Calcium is needed throughout life, but the amount changes over time. A lot of calcium is required during the growing years to build strong bones; a bit less during the middle years to maintain the strength, and much more lately in life to prevent bone loss. The body stores 99% of its calcium in bones and teeth. The remaining 1% is stored in blood and soft tissue. If insufficient calcium is consumed, the body will take the balance of the calcium it needs from its own resources. IT WILL STEAL FROM YOUR BONES. If the body continues to take calcium from bones over a long period, Osteoporosis will develop. Osteoporosis is a serious disease in which bones become fragile, causing them to fracture easily. One important step in preventing osteoporosis is to consume one’s daily calcium requirement. Dairy products and calcium-fortified foods are the best sources of calcium. The amount of calcium that is needed depends on age and gender. The more calcium there is in the bones when loss begins, the less likely it is that bones will become fragile and fracture more easily. The most effective way to get the correct amount of calcium is by eating enough calcium rich foods every day. Dairy products form one of the richest forms of calcium. Calcium is contained in the non-cream portion of milk and so when milk is skimmed, all the calcium remains. In fact litre for litre, or pint for pint, skimmed and semi-skimmed milk contains slightly more calcium than whole fat milk. Calcium is found in many foods, and calcium supplements in pill-form can be taken when the recommended daily calcium intake from food is not met. Preventing osteoporosis takes a lifelong commitment to calcium, because you cannot necessarily make up for it later. Nutritionists have it on record that if everyone would just reach for milk instead of soft drinks at least 3 times a day, it would go a long way to solving a calcium deficiency. CALCIUM IS IN CRISIS. Generations of mothers have uttered the words ‘ drink your milk and go and play outside’, the result being vitamin D from sunshine and calcium from milk. Fat free, skim and low fat milk are excellent choices because they make it easy to get enough calcium without adding a lot of extra fat and saturated fat to the diet. For example, a glass of whole milk contributes 25% of the total saturated fat for a day, while a glass of low fat milk contributes only 7.5% of the total saturated fat. There are now a variety of milk products available that include different levels of fat and even different flavours. One cup (250ml) contains about 300 mg of calcium. When considering the chemistry of milk, it is useful to know that low fat milk such as 2% is almost ideal for providing the steaming, frothy milk required for cappuccinos and Lattes. No other species besides humans drink milk beyond infancy, and no other species (except domestic cat and dogs, who are taught the habit by humans) drinks the milk of another species. Many people must be cautious about consuming milk and milk by-products. There are several reasons for this. For people with lactose intolerance, milk is often better digested when drunk in small amounts or combined with other foods such as cereal. Lactose-free milk products are now available. The product is obtained from the processing of the Soya Bean. It provides products known as soy or soya. These are a suitable and useful substitute for anyone with intolerance to cows milk. The Chinese have always drunk soya milk. Soymilk can be used in cooking and can be used to make soya milk yoghurt. Tofu, or soya cheese, another derivative of the Soya Bean has many uses. Soya milk is low in calcium and therefore some brands are fortified. MILK ALLERGY is a true allergic reaction by the body’s immune system to one or more of milk’s proteins. For those people who cannot have any milk, calcium can come from many non –dairy sources. Eating dark green, leafy vegetables such as kale and broccoli and tofu processed with calcium and many other foodstuffs provides the calcium one needs. Although sadly, not as effective as the dairy alternative. Again calcium supplements are available and easy to use. Only 2-3% of the population are truly allergic to milk. Cow milk allergy is mainly a condition of infancy and around 9 or 10 affected grow out of it by the age of 3. Concerned parents should consult a doctor and not go by unspecialised advice. It has been suggested that milk and dairy products increase mucous production and that avoiding milk with therefore alleviate the respiratory symptoms associated with colds. This remains a controversial conclusion and good scientific evidence to support it, is not readily available. Dairy farming is a complex process making effective use of new technology and scientific advances. Milking machines save on labour and make it possible to keep more cows more cost-efficiently. Machine milking is gentle and used correctly, causes no harm to the cows. Scientific analysis of feed has resulted in rich compound diets and better production. Dairy cows are fed roughage – legumes, grasses and corn silage as well as specially formulated commercial concentrates. Milk is a perishable commodity. It must be cooled to between 2-5 degrees C. within 2 hours of leaving the cow. The whole dairy industry is attentive to processing milk quickly and efficiently and carefully complying with established legal standards of health and sanitation. Raw milk is collected from farms daily or every other day and taken to dairies by tanker for processing. On arrival the milk is tested for appearance, smell and temperature and a sample is taken for analysis in laboratories at the dairy. These products are pasteurised and processed into other dairy products. ANSWERING QUESTIONS AND EXPLORING SITUATIONS CONCERNING THE STEPS TAKEN IN THE PROCESS OF MAKING MILK SAFE TO DRINK. Pasteurisation involves heating milk to high temperatures to kill harmful bacteria that can cause illness. Milk is heated to a high temperature and then rapidly cooled. Pasteurisation does not involve the use of any additives. Apart from making milk safe to drink, pasteurisation increases the length of time it can be kept before it spoils. The nutrient losses due to pasteurisation are so small, they are considered insignificant. IS IT SAFE TO DRINK RAW MILK? No. Milk that has not been pasteurised is raw milk. Bacteria found in raw milk can be harmful. Homogenisation is a mechanical process that changes the size of the fat globules in milk. It keeps the fat from separating from the rest of the milk and gives milk a smooth creamy texture. Homogenisation does not change the nutrient value of the milk. WHY IS MILK OPAQUE AND IS IT WHITE OR DOES IT HAVE A YELLOWISH TINT? It is opaque because it contains very small particles of casein (milk protein). The fat globules in milk give it a yellowish tint. Cows, which are fed a carotene rich diet such as grass or hay, pass the orange-coloured vitamin A into the milk fat that makes milk slightly yellowish. Milk that has been pasteurised by a special method involving ULTRA HIGH TEMPERATURES is called UHT milk. This process extends the shelf life of the milk without changing the nutrient value. UHT milk does not need refrigeration until after it is opened. Packaging protects products from spoilage and important information on size, ingredients and nutritional value can be given. The packaging in no way affects the quality or make-up of the contents. Sterilized milk is homogenised milk heated to 150 degrees C (300 degrees F) for several seconds. Sterilization destroys all germs. Date stamped plastic bottles and cartons have a shelf life of several months and can be kept at room temperature. After opening it should be stored in the refrigerator. It has a flavour like caramel. No. If a cow becomes sick and is given antibiotics, she is milked separately from the rest of the herd and the milk is discarded. This continues until she has recovered from her illness and no antibiotics are detected in her milk. HOW IS THE SAFETY OF OUR MILK GUARANTEED? Tests are done both at the farm and at the processing plant to ensure the milk is of good quality and free of antibiotics. Any milk that does not meet strict standards is discarded. The highest level of hygiene is observed at all times. During earlier years, milk was packaged into glass bottles, usually by hand and eventually with machines. Today milk is packaged into either plastic or paper cartons by an automatic packing machine. The cartons are constructed so that they do not affect the milk in any way. Milk also contains ingredients so small they cannot be seen, not even under an electron microscope. Yet they are very important, both in diet and in the manufacture of milk products. These are whey proteins. The major whey proteins have a high nutritional value, partly because they contain sulphur-containing amino acids. Milk besides being a very popular drink and nutritious meal, also provides products which enhance our diets. Butter: Butter is an important ingredient in almost all recipes and is derived directly from milk fat that is pasteurised and then churned causing the fat to turn into butter. Cheese: Cheese is obtained by the addition of bacteria to milk to form a soft curd. The liquid part of the milk is then removed and the curd made into different types of cheese. Cheese can be curdled using an agent called rennet, present in the tissue of the calf stomach. This system of curdling produces a non-kosher cheese. Cottage cheese: This is an example of a kind of cheese that is sold fresh, without being aged. Cream: Cream is the milk fat that rises to the top in non-homogenized milk. It is obtained by separating it from the remaining milk. Sour Cream: Adding acid-producing bacteria to cream causing it to sour produces sour cream. This contains up to 18% fat. Yoghurt : Yoghurt, a popular food today is made by mixing non-fat dry milk with partly skimmed milk and adding bacteria and flavouring. Milk Powders: Drying is one of the best methods of preserving milk for future use. Fluid milk can be processed removing some of the water, which creates evaporated or (if sugar is added) sweetened condensed milk, products with 40% or more milk solids. Removing all the water produces dry milk powder with less than 4% moisture content. Non-fat dry milk is the result of removing moisture from pasteurised non-fat milk. It contains no more than 1.5% milk fat. All milk components i.e. proteins, lactose, minerals and fat are retained in evaporated milk. It has many advantages compared with fluid milk. Dry milk is much less costly to transport and store. The removal of moisture from milk inhibits microbial growth. This increases its shelf life to 12 –18 months for non-fat dry milk. Specialized formulas can be produced to meet the needs of athletes, seniors or individuals recovering from illness. Most especially in this day and age when food prices are exploding, milk powders provide a less expensive option. Certainly in developing countries where refrigeration is not always available, it is a very important form of a necessary nutrient. Fresh dairy products should be kept in the refrigerator at 5 degrees C (40 degrees F) or less. Pasteurised milk has a relatively short life (7 – 10 days) and should be used immediately, or stored in the refrigerator. Sterilized milk will keep unopened for several months, but once opened the milk must be kept refrigerated and used within 4 – 5 days. UHT milks have a longer shelf life, but once opened, the same requirements as pasteurised apply. Reconstituted milk (from dry or evaporated milk) and opened canned milk should be kept in the refrigerator. 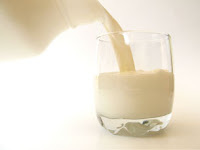 Milk in clear containers, for example in glass or plastic that is exposed to sunlight may lose riboflavin and change flavour. It should be kept in the refrigerator. Unopened canned milk and non- fat dry milk should be stored in a dry place. Packages of dry milk should be kept tightly closed. If dry milk is exposed to air or humidity it becomes lumpy and difficult to mix. Milk is unique. It is a staple throughout our lives. It is an indispensable ingredient in cooking and an essential in many sauces. Enjoy a glass of cool refreshing milk and let its delicious content provide your body with health.